Microsoft Intune app protection policies help protect your company data and prevent data loss. Your employees use mobile devices for both personal and work tasks. While making sure your employees can be productive, you want to prevent data loss, intentional and unintentional. You'll also want to protect company data that is accessed from devices that are not managed by you. 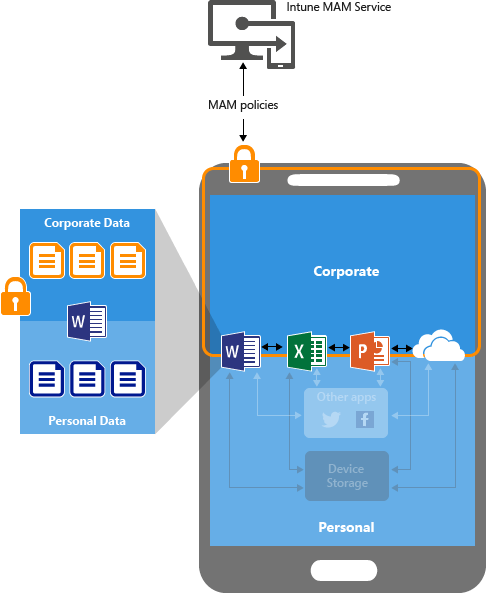 You can use Intune app protection policies independent of any mobile-device management (MDM) solution. This independence helps you protect your company’s data with or without enrolling devices in a device management solution. By implementing app-level policies, you can restrict access to company resources and keep data within the purview of your IT department. Enrolled in Microsoft Intune: These devices are typically corporate owned. Enrolled in a third-party Mobile device management (MDM) solution: These devices are typically corporate owned. Mobile app management policies should not be used with third-party mobile app management or secure container solutions. Not enrolled in any mobile device management solution: The devices are typically employee owned devices that aren't managed or enrolled in Intune or other MDM solutions. 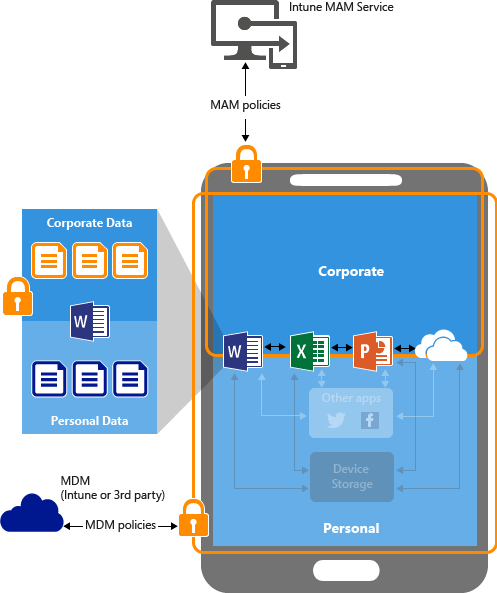 You can create mobile app management policies for Office mobile apps that connect to Office 365 services. You can also protect access to Exchange on-premises mailboxes by creating Intune app protection policies for Outlook for iOS and Android enabled with hybrid Modern Authentication. Before using this feature, make sure you meet the Outlook for iOS and Android requirements. App protection policies are not supported for other apps that connect to on-premises Exchange or SharePoint services. Protecting your company data at the app level. Because mobile app management doesn't require device management, you can protect company data on both managed and unmanaged devices. The management is centered on the user identity, which removes the requirement for device management. End-user productivity isn't affected and policies don't apply when using the app in a personal context. The policies are applied only in a work context, which gives you the ability to protect company data without touching personal data. There are additional benefits to using MDM with App protection policies, and companies can use App protection policies with and without MDM at the same time. For example, consider an employee that uses both a phone issued by the company, and their own personal tablet. The company phone is enrolled in MDM and protected by App protection policies while the personal device is protected by App protection policies only. MDM makes sure that the device is protected. For example, you can require a PIN to access the device, or you can deploy managed apps to the device. You can also deploy apps to devices through your MDM solution, to give you more control over app management. Intune app protection policies platform support aligns with Office mobile application platform support for Android and iOS devices. For details, see the Mobile apps section of Office System Requirements. The Intune Company Portal is required on the device to recieve App Protection Policies on Android. For more information, see the Intune Company Portal access apps requirements. When apps are used without restrictions, company and personal data can get intermingled. Company data can end up in locations like personal storage or transferred to apps beyond your purview and result in data loss. 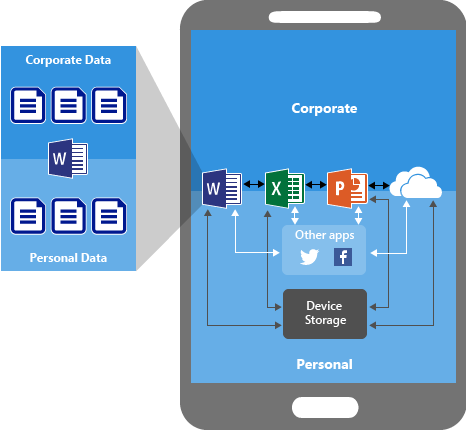 The arrows in the preceding diagram show unrestricted data movement between both corporate and personal apps, and to storage locations. Data relocation policies like Prevent Save As, and Restrict cut, copy, and paste. Access policy settings like Require simple PIN for access, and Block managed apps from running on jailbroken or rooted devices. The preceding illustration shows the layers of protection that MDM and App protection policies offer together. The preceding diagram illustrates how the data protection policies work at the app level without MDM. You can't deploy apps to the device. The end user has to get the apps from the store. You can't provision certificate profiles on these devices. You can't provision company Wi-Fi and VPN settings on these devices. If a OneDrive administrator browses to admin.office.com and selects Device access, they can set Mobile application management controls to the OneDrive and SharePoint client apps. The settings, made available to the OneDrive Admin console, configure a special Intune app protection policy called the Global policy. This global policy applies to all users in your tenant, and has no way to control the policy targeting. Once enabled, the OneDrive and SharePoint apps for iOS and Android are protected with the selected settings by default. An IT Pro can edit this policy in the Intune console to add more targeted apps and to modify any policy setting. By default, there can only be one Global policy per tenant. However, you can use Intune Graph APIs to create extra global policies per tenant, but doing so isn't recommended. Creating extra global policies isn’t recommended because troubleshooting the implementation of such a policy can become complicated. While the Global policy applies to all users in your tenant, any standard Intune app protection policy will override these settings. Apps that support multi-identity let you use different accounts (work and personal) to access the same apps, while app protection policies apply only when the apps are used in the work context. For an example of personal context, consider a user who starts a new document in Word, this is considered personal context so Intune App Protection policies are not applied. 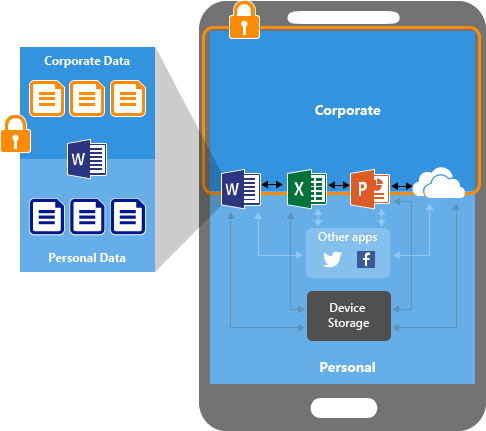 Once the document is saved on the corporate OneDrive account then it will be considered corporate context and Intune App Protection polices will be applied. For an example of work context, consider a user who starts the OneDrive app by using their work account. In the work context, they can't move files to a personal storage location. Later, when they use OneDrive with their personal account, they can copy and move data from their personal OneDrive without restrictions. Learn more about the apps that support MAM and multi-identity with Intune. Third-party apps such as the Salesforce mobile app work with Intune in specific ways to protect corporate data. To learn more about how the Salesforce app in particular works with Intune (including MDM app configurations settings), see Salesforce App and Microsoft Intune.